Hello, I am back with a short little book review this time. I know it has taken me super long to post this review but schedule constraints are worst due to increased workload from the uni part. I had got this book a few months back to be speaking of this fairly, I was pretty excited to check this out since I had also reviewed a book from the same author which turned out to be really amazing, you can check out that review by clicking here. Apart from that, to be really honest I liked the book cover, you know food... This book was categorised in feminism in Goodreads hence that was another part that increased my curiosity. 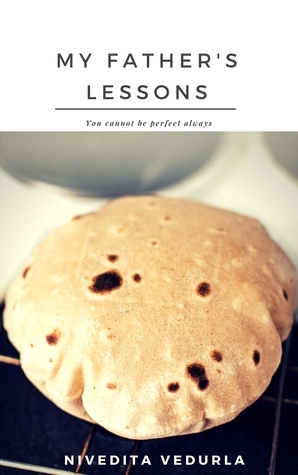 Do you often think why your chapattis are not round? Do you feel you cannot prioritize things that you need to concentrate on? Then you got to read about Meghna’s Father lessons to her about seeing life from a different perspective. Grab a copy now and rediscover your view to see life. This book is nothing like the ones I usually read and review. It was different in terms genre, concept and the content. I'd say rather than it being one single story it was a collection of many short stories where each of the short story had the stand and message of their own. This book showed many instances of an average girl's life. Simple things that occur in her life as a girl grows up are very well shown. It is a nice light read. Honestly I didn't find anything exciting enough to just go and grab a read or just plain worse to even neglect. It somewhere landed in the 'okay' zone at least for me. If you are a quick reader than this book won't even take more than 10-15 minutes. Yes, it's that short story. Since it was short enough and I don't have much to talk about it without giving out spoilers to that's all on my part for this one. If you wanna try it out yourself than you can follow one of the links below to check it out for yourself. Do subscribe to blog here for more such updates!